Burgundy has always been one of my favorite colors to wear - it's universally flattering and warms up any cold-weather look. Needless to say, I'm thrilled that it's one of the biggest color trends for the fall. Give this staple color a fresh spin by pairing it with bright, unexpected tones - or by wearing it in a leather jacket or shoe. My favorite, however? 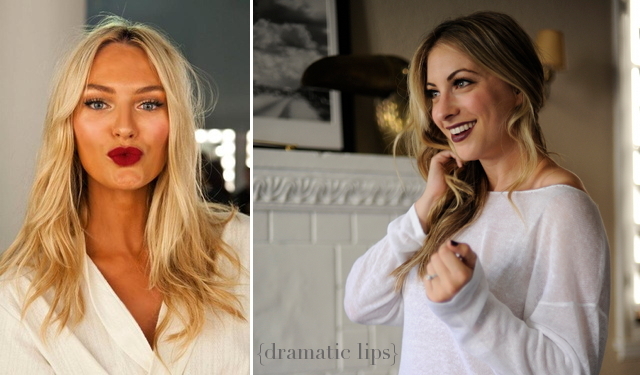 The bold burgundy lip that I've been seeing everywhere lately - paired with a neutral eye, does that just scream sexiness or what? Check back next week - I'll walk you through exactly how to create this dramatic look for yourself! I've tried a darker, burgundy matte lipstick by NARS and really loved it!! love the round up! ohh what shade? i really want to invest in a great NARS lip product for fall! I'm totally blanking! I'll have to ask the makeup artist that helped me!! I can't tell you how much I love these wine-toned things! Although I can't quite pull off the lipstick, I do love the nail polish, the latest J.Crew coat, and a particular Dooney & Bourke bag, all in those tones. That said, I also love red wine. Tis the season!